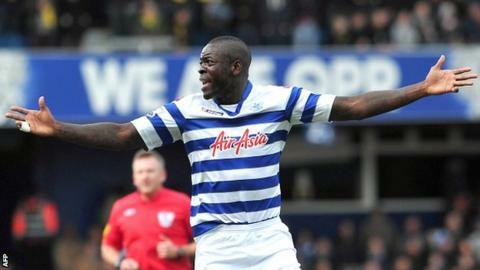 Christopher Samba says he is "ashamed" of QPR's Premier League defeat at Swansea and is demanding an improvement against Manchester United on Saturday. Bottom club Rangers were beaten 4-1 at the Liberty Stadium on 9 February. Samba, a £12.5m signing from Anzhi Makhachkala last month, said: "We shouldn't be ashamed of performances but I was ashamed of mine and the team's against Swansea." "We need to show great attitude and commitment." QPR, who are four points adrift at the foot of the table, face a Manchester United side boasting a 12-point lead at the top. Former Blackburn defender Samba was a surprise addition to the QPR squad on the final day of the January transfer window, moving from Russian on a four-and-a-half-year deal worth a reported £100,000 a week. He made his debut in the goalless draw against Norwich, QPR's fourth clean sheet in five league matches. But their defence was torn apart by Swansea two weeks ago and 28-year-old Samba said: "I have nothing to hide - I was very angry. I said what I saw to the players. "There's nothing worse than feeling full of regret." QPR were 2-0 down inside 18 minutes against Swansea. Although injury-hit striker Bobby Zamora came off the bench to halve the deficit, the hosts scored two more to run out comfortable winners. Samba said: "Bobby Zamora showed us what the Premier League is about when he came on. "I think more of the players should have his attitude: urgency that reflects we have 12 games left and must play every one like a cup final."